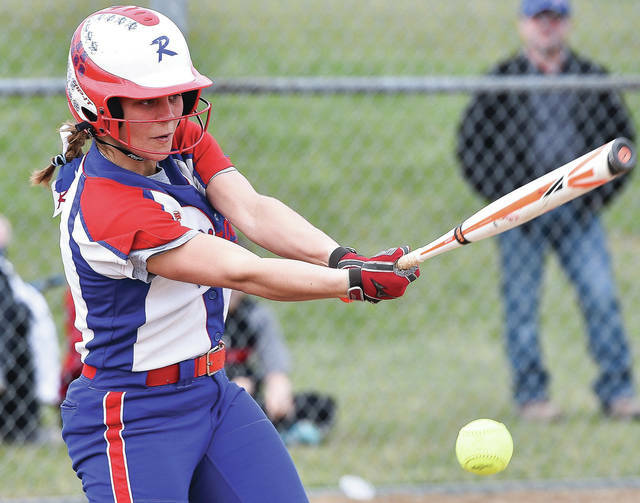 Riverside’s Courtnie Smith hits a grounder during a nonconference game against Anna on Friday in De Graff. Smith was 2 for 3 with 2 RBIs. Anna's Brandi Weber hits during a nonconference game against Riverside on Friday in De Graff. Riverside's Jalynn Stanley pitches during a nonconference game against Anna on Friday in De Graff. Anna’s Grace Baurer waits for the throw as Riverside’s Jalynn Stanley runs for home during a nonconference game on Friday in De Graff. 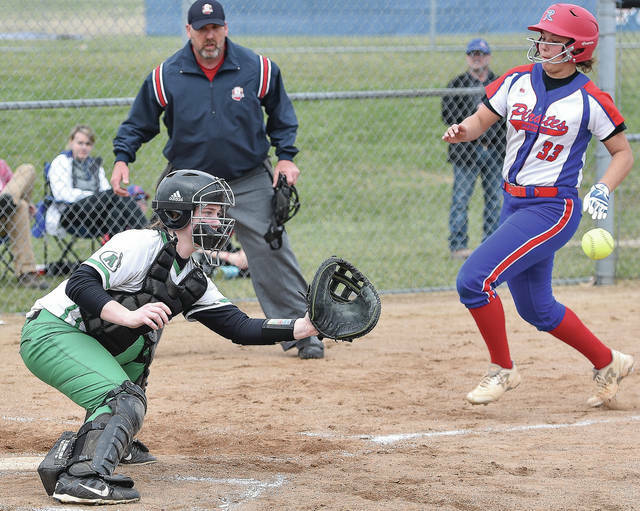 Anna's Elaina Crosson picks up a bunt as Riverside's Leah Kelsey runs for first during a nonconference game on Friday in De Graff. 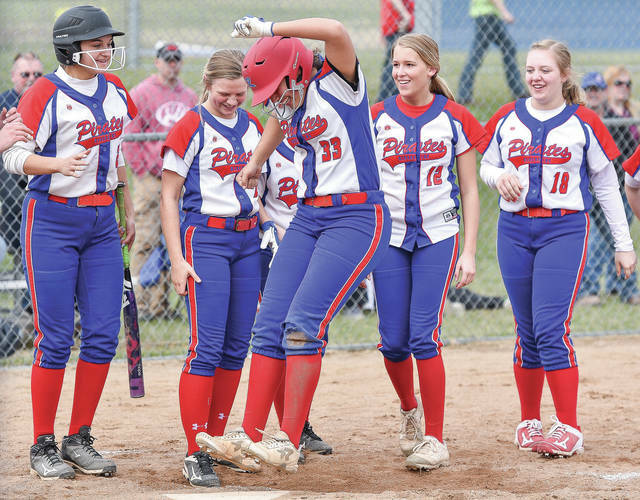 Riverside’s Jalynn Stanley jumps onto home plate after hitting a home run in the fourth inning of a nonconference game against Anna on Friday in De Graff. Stanley was 4 for 4 with 3 RBIs. View more photos from Anna at Riverside photo. 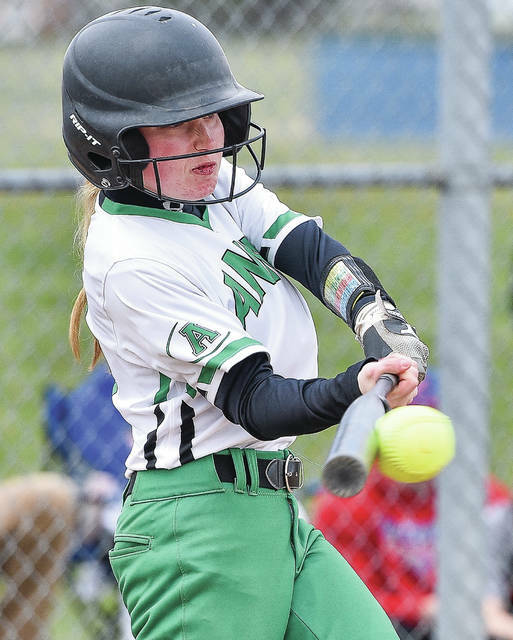 DeGRAFF — After a hot start at the plate at the beginning of the season, Anna has struggled to hit in its last two games and is looking for a way to get the ball in the air again. Riverside gave the Rockets a display of putting the ball in the air on Friday. The Pirates racked up 14 hits on Anna senior pitcher Elaina Crosson on their way to a 10-0 win in five innings in a nonconference softball game. It was a usual output for the Pirates (5-1, 2-0 Northwest Central Conference). Though they lost five players off last year’s 20-win team, they’ve scored 10 or more runs in four of their six games. Anna (4-2, 3-1 Shelby County Athletic League) hadn’t allowed more than five runs in any of its first five games and had given up only 13 total. 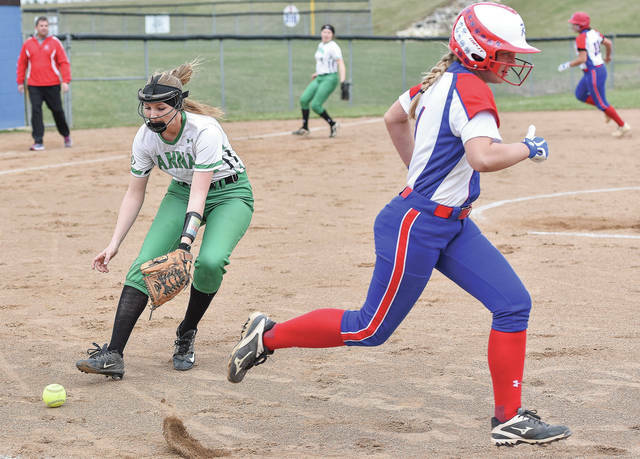 Anna managed just one hit against Riverside sophomore pitcher Jalynn Stanley, which came when Carrie White hit an outfield single in third. The Rockets had three total baserunners, with the other two coming on a walk and hit batter. Stanley was 4 for 4 at the plate with 3 RBIs, including a solo home run in the fourth inning that increased Riverside’s lead to 8-0. Her home run landed about five yards over the fence in right-center field. “She’s the full package,” Phelps said. “She can hit, she can play shortstop, she can pitch. It was the second loss in two days for Anna. The Rockets, which had scored 52 runs in their first four games, haven’t scored in their last two. They lost to Houston 3-0 in SCAL play on Thursday. “They’re just a good, solid team,” Anna coach Mike Place said of Riverside. “We knew coming in that if we didn’t hit, we were going to be hurting. We just didn’t hit. The Rockets struck out only twice but hit into eight infield groundouts, which Place said the team will have to address. Riverside scored five runs on five hits and a walk in the first. Stanley hit an RBI double on a hard grounder that went between third baseman Brandi Weber’s legs. Jordy Marshall also hit an RBI double to left field in the inning. The Pirates added two runs in the second on an RBI single to center field by Stanley and an RBI single to left by Kalin Kreglow. Stanley hit a single in the fifth that drove in a run after a throwing error, then Courtnie Smith followed with an RBI single to left to end it. Smith was 2 for 3 with 2 RBIs and Kreglow was 2 for 3 with 1 RBI. Leah Kelsey was 3 for 3. The Pirates will play again on Saturday at Miami East and will host Lehman Catholic in NWCC play on Monday. Anna’s tough slate continues Saturday with a doubleheader at New Bremen. The Rockets will travel to Jackson Center on Monday in SCAL play. “We’ll just go back at it and see what we can do to start hitting again,” Place said. “Go to the cage, get some live pitching in. Anna’s Brandi Weber hits during a nonconference game against Riverside on Friday in De Graff. 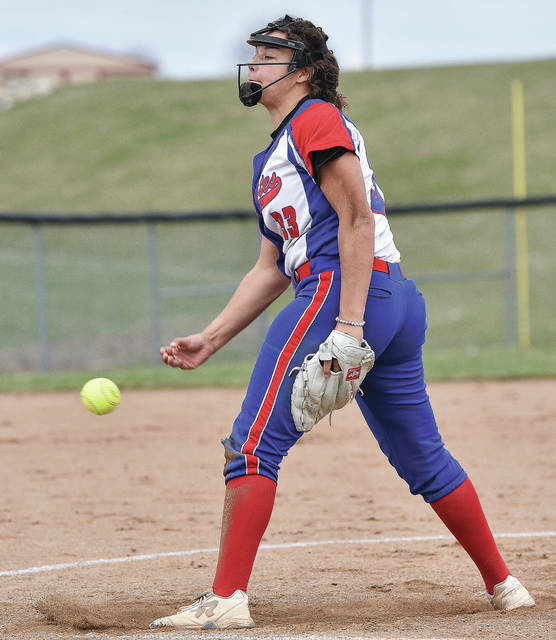 Riverside’s Jalynn Stanley pitches during a nonconference game against Anna on Friday in De Graff. Anna’s Elaina Crosson picks up a bunt as Riverside’s Leah Kelsey runs for first during a nonconference game on Friday in De Graff.